As has become abundantly clear to me over the last several weeks, I could be a lot more prolific with my blog posts if I were just a little bit better and more consistent with self-promotion. Truth be told, a lot of time goes into editing The Testing Show. I volunteered a long time ago to do the heavy lifting for the show editing because of my background in audio editing and audio production from a couple decades back. Hey, why let those chops go to waste ;)? Well, it means I don’t publish as often since, by the time I’ve finished editing a podcast, I have precious little time or energy to blog. That is unless I blog about the podcast itself… hey, why not? So this most recent episode of The Testing Show is “Machine Learning, Part 2” and features Peter Varhol. Peter has had an extensive career and has also done a prodigious amount of writing. In addition, he has a strong mathematical background which makes him an ideal person to talk about the proliferation of AI and Machine Learning. Peter has a broad and generous take on the current challenges and opportunities that both AI and Machine Learning provide. 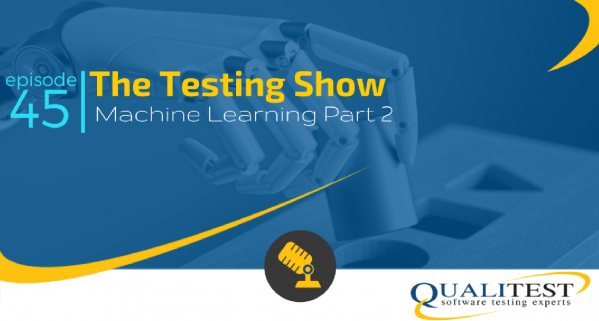 He gives an upbeat but realistic view of what the technologies can and cannot do, as well as ways in which the tester can both leverage and thrive in this environment. Anyway, I’d love for you to listen to the show, so please either go to the Qualitest Group podcast page or subscribe via Apple Podcasts. While you’re at it, we’d love it if you could leave us a review, as reviews help bubble our group higher in the search listings and help people find the show. Regardless, I’d love to know what you think and comments via this page are also fine. Most of the gaming sites play the most popular online casino games in Thailand. One of the affiliates of Gclub69 is the Six Clubs of the Nine, a web site of a legitimate casino. There are many online casino games to choose from, Golden slot such as roulette, baccarat, roulette, gambling Dragon Ball Slots, online lottery and online gambling games, more than 200 live broadcasts from Poipet and Cambodia with world-class standards. Financial stability High security and reliability. This is also another online casino web site. Many other leading online casino games. We are ready to give advice all the time. Just contact the Call Center to inquire whether it is an entrance, how to play through the web, download link. How to install the program. On both PC and mobile phones, both Android and ios. สล็อตออนไลน์ Deposit - withdraw - transfer subscription, get free trial code and promotions. We are ready to serve you with a professional team 24 hours a day.